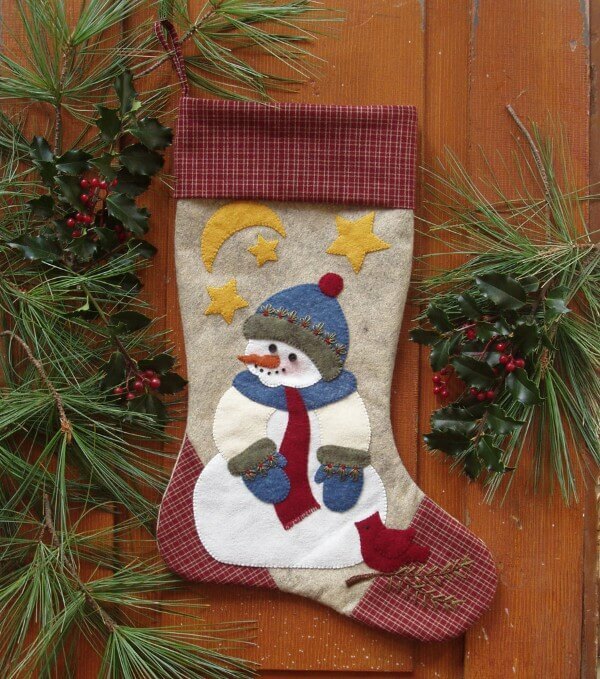 Hanging the Christmas stocking is even more special when the stocking is lovingly handmade. Create your own tradition with this jolly Snowman design. Illumined by the light of the stars and a crescent moon, the snowman enjoys the company of a bright cardinal nestled at his base. Colors are cobblestone, dark red, white, cream, blue, green, and gold. Finished size is 10� x 15 1/2�. Kit has everything needed to complete the project including all woolfelt for stocking and appliques, 100% cotton fabric for cuff, toe and heel, buttons, and embroidery floss for embellishments.